I have lost some teeth in the back of my mouth. I need to repalce them. My dream is to get dental implants and I have the money. The problem is I have severe metal allergies and I know they are done with metal implants. Are there any options which are metal free? I’m glad you wrote. There is definitely a way for you to get dental implants, even with your metal allergies. First, I would check to see which metals are an issue for you. Traditional dental implants are made from titanium which are considered very biocompatible. They’ve been used for years in the human body with things like hip replacements. It may be your body won’t have an issue with titanium. However, if you are allergic to titanium there is now a metal-free option. 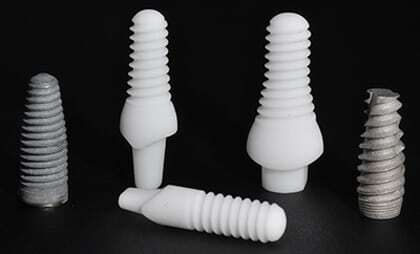 Zirconia implants are gaining in popularity. Nicknamed liquid steel, zirconia is very strong. Both are strong and can provide for you a healthy tooth replacement. The only real hesitation many dentists have about using them over their titanium counterparts is the fact that they are newer. We have lots of evidence and documentation on how long the titanium implants will last. They’ve got a great track record. Because the zirconia implants are new, we don’t have any track record we can refer to. It’s likely they’ll last just as long as their titanium counterparts, but we don’t have the evidence yet. This won’t affect you, but I’m going to bring it up for the benefit of others who may be reading this. 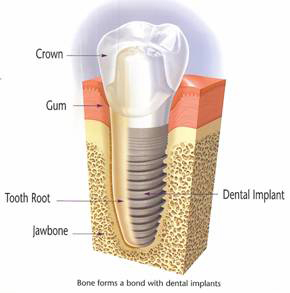 If you are getting a dental implant for a tooth which is visible when you smile, you want to think long term. 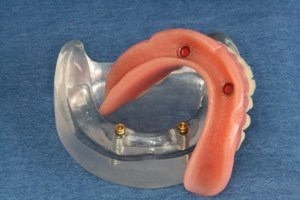 The color the dental crown will be made when it is created is permanent. If you’re happy with the color of your teeth than that should be no problem. However, if you’ve considered whitening them, it is important you do the teeth whitening before your dental crown is made. This way it can be made to match the white color of your teeth. If you wait and whiten your teeth later, the crown will have to be re-made in order to get them to match, costing you more money. My husband was in an accident which caused him to lose a tooth. He chose to replace it with a dental implant because he wanted the best replacement possible. He’s in a very public job and appearance is important. About a month after he had the implant done I started noticing his breathtaking a turn for the worse. He’s very diligent with his oral care so I thought maybe it was just a one-day thing, but it’s been a week and it’s getting steadily worse. Is this normal with dental implants or should I bring it up with him? I only want to bring it up if there’s something he can do about it. I don’t want to make him self-conscious. You sound like a loving wife. I’m glad you noticed this about your husband’s breath because this is not a normal side-effect of getting dental implants. If you are certain nothing has changed with his oral hygiene habits then he may be looking at the beginning of an infection. If it’s not dealt with quickly, he could be looking at dental implant failure and having to start completely over on the procedure. You could start out by asking him how the implant has been feeling. This way you’re not bringing up his breath. He may mention that it feels weird or he has a bad taste in his mouth. In that case, you can tell him to see his implant dentist in order to have it looked at. If there is an infection and he loses the implant, starting over will require an additional procedure of bone grafting to get it done. Make sure he stays on top of this. I’m only mentioning this part because you said your husband has a very public job and his appearance is important. If he plans on whitening his teeth, make sure he does it before it is time to make his implant crown. That way, he can have the porcelain crown made to match is whiter teeth. Once the crown is done, the color won’t change, not even with professional teeth whitening. He’s likely a very busy man with his job, so let him know with Zoom Whitening it can be done in just one appointment.